Death is not an event of life. Death is not lived through. If eternity is understood not as an endless temporal duration but rather as timelessness, then whoever lives in the present lives eternally. Our life is endless in the same way that our field of vision is without limit. Ludwig Wittgenstein (1889-1951), Tractatus Logico-Philosophicus, London/New York, 1922. Proposition 6.4311. 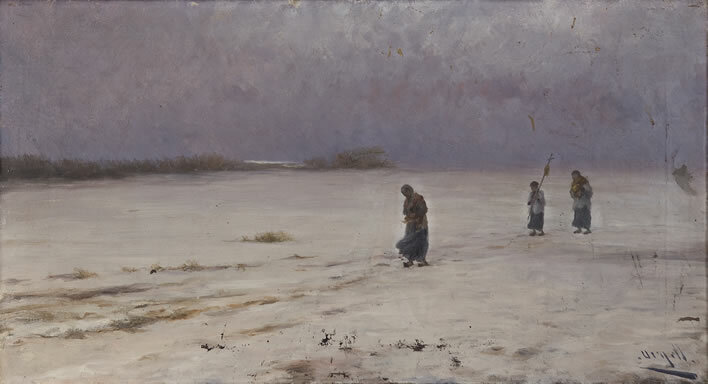 Modesto Urgell e Inglada (1839-1919), La vuelta del entierro, 19c., Museo Nacional del Prado, Madrid [P05856] (ex. Provincial Museum of Lugo) Source. The Return from the Burial. A priest and two altar boys, one of whom carries a cross, are returning from a burial service across a bleak and windy winter landscape. Urgell was fond of painting horizons – whether meant in Wittgenstein's endless sense - who knows?